The 8th BRICS (Brazil, Russia, India, China and South Africa) Summit held in Goa recently, a fair share of focus was laid upon issues relating to energy and environment. The last couple of weeks have highlighted India’s commitment towards addressing global environmental concerns. First, it ratified the Paris climate change agreement; second, it signed the Kigali agreement to amend the Montreal Protocol (in order to cut down its hydrofluorocarbons by 85% of the values in 2024-26 by the year 2047); and now it has agreed to cooperate on a whole lot of sustainability issues through the Goa Declaration. To reaffirm the guiding principles for the implementation of the 2030 Sustainable Development Goals (SDGs) agenda and harp upon the Common But Differentiated Responsibilities (CBDRs) is a good way to remind the developed nations of their duties without shying away from our own. The establishment of the Technology Facilitation Mechanism within the UN with a mandate to facilitate technology for the implementation of the SDGs has been welcomed by BRICS. With India’s recent push on the use of technology in social sector, it would clearly benefit from it. Even the 2030 SDGs call for global partnerships for sustainable development that would involve financial assistance, technology transfer, promotion of trade and more importantly capacity building at national levels. The BRICS commitment and reaffirmation of the goals under the 2030 Agenda for Sustainable Development (also referred to as SDGs) would ensure its focus on access to health, sustainable agriculture, access to affordable, reliable and sustainable energy, sustainable water management and sanitation, sustainable cities and sustainable industrialization. The 2030 Agenda calls for focusing on sustainable consumption and production patterns and this would ensure that we manage our wastes of all types and forms efficiently. Conservation and sustainable use of marine resources and increased focus on forestation and biodiversity conservation are a part of the SDGs with climate change adaptation and mitigation serving as the backdrop. The BRICS nations have also committed themselves to the protection of wild flora and fauna, and prevention of trade in endangered species. With Russia and India working closely in the area of civil nuclear energy and the Kudankulum power plant being the result of such cooperation, nuclear energy has been recognised as being crucial to BRICS energy security plans. Technology transfer and access to finance shall play a crucial role for not just nuclear energy but also in ensuring overall energy access, security and affordability. That the BRICS nations have signed a memorandum of understanding (MoU) on energy saving and energy efficiency shows their commitment in this regard. They have also called for the wider use of natural gas in order to honour their commitment under the Paris Agreement. The BRICS nations have agreed to share technical expertise in the areas of abatement and control of air and water pollution, efficient management of waste and sustainable management of biodiversity, and have emphasised upon the importance of participation by BRICS countries in environmental cooperation initiatives, including developing a platform for sharing environmentally sound technologies. The BRICS nations have underlined the importance of science-based agriculture and the use of information and communications technology to address issues relating to food security and malnutrition. The signing of the MoU for establishment of the BRICS Agricultural Research Platform to intensify co-operation in agricultural research policy, science and technology, innovation and capacity building, including technologies for small-holder farming, is a welcome step. There is a need for sustainable management of natural resources in agriculture and innovation remains the key to it. Environment remains at the epicenter of the BRICS deliberations as it is interrelated with issues relating to health, sanitation, water, food and overall economic growth. That the BRICS nations have come together to address these concerns is a welcome step. Technology transfer and finance remain the key in addressing sustainability concerns. India and Russia have signed 16 agreements for cooperation on the sidelines of the Summit and these include building smart cities, the use of technological solutions in smart cities and besides others laying gas pipelines to India, co-operation in the oil and gas sector, and education and training in the oil and gas sector. Russia remains one of the largest producers of natural gas in the world and India one of its largest importers. With renewed focus on cleaner fuel and energy security, agreements like these would help India attain its goals relating to energy and environment in order to honour its international climate change commitments. The BRICS Summit has opened numerous avenues for co-operation in sectors such as clean energy, health, environment, trade, agriculture and science, technology and innovation besides others. 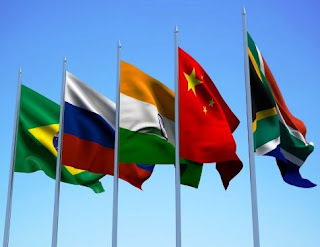 Considering that more than 40% of the world’s population resides in the BRICS countries, the decisions taken by these five nations would have a significant impact on the rest of the world.